This post is by sustainable community organizer Carey deVictoria-Michel. You can read her previous posts here and here. I started my positions with YEA in September when I helped launch one of our programs at Unity Minnesota Internship Center (MNIC) in lively North Minneapolis. Yea Corps’ mission is to provide hands-on sustainable education to youth empowering them for life, education, and employment. This is what YEA has been gradually implementing at Unity MNIC students during this school year into the Spring. 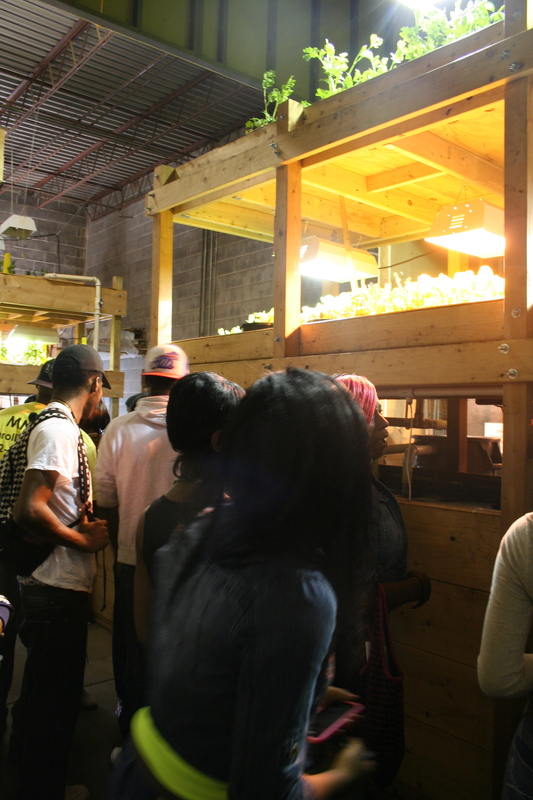 The YEA Unity field trip to an aquaponics business in Minneapolis. YEA program managers, including myself, arrive at Unity MNIC most every Wednesday. Usually we get to the school, greet our regular students at the entrance when they are hanging out and taking one of their breaks. Our program is based out of the top level of the school in the upper-class classrooms in a shared two room space. Students work in this space with teachers, scattered at different tables and working on various assignments, or taking one the required standardized tests. Students at Unity come from diverse backgrounds, and have the opportunity of alternative education at MNIC, where they are given flexible classes and assistance in getting their diplomas. The students are voting on a design for the aquaponics system for the classroom at Unity. The YEA Corps program was implemented at Unity through a grant from Hennepin County Green Partners, to provide students with an experiential environmental education program. Thus far, participants of the project have learned about plant life cycles, producing fish and plants through aquaponics systems, and sustainable entrepreneurship; they have planted cilantro seedling, painted classrooms, and constructed biofilter stands. All of these activities are directed towards the production of fresh and local vegetable and Tilapia fish onsite in the classrooms, to then be distributed to the North Minneapolis community. Aquaponics is an agricultural system that integrates fish life in tanks that circulate water and nutrients into garden beds of vegetables and plants that benefit from nitrogen fixings form the fish. 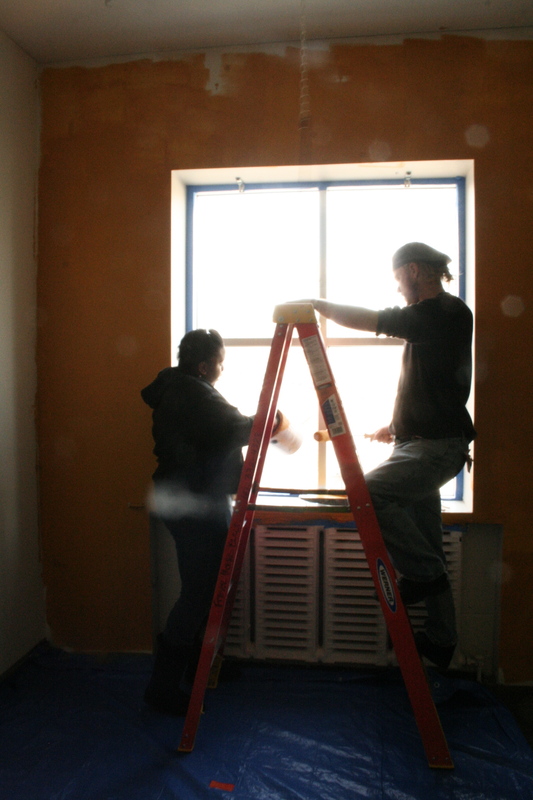 Curtis and Joyce are painting the room where the aquaponics system will be built at Unity. There are roughly thirty students active in the project who work in groups focused on business, marketing, construction and design, and sustainability. 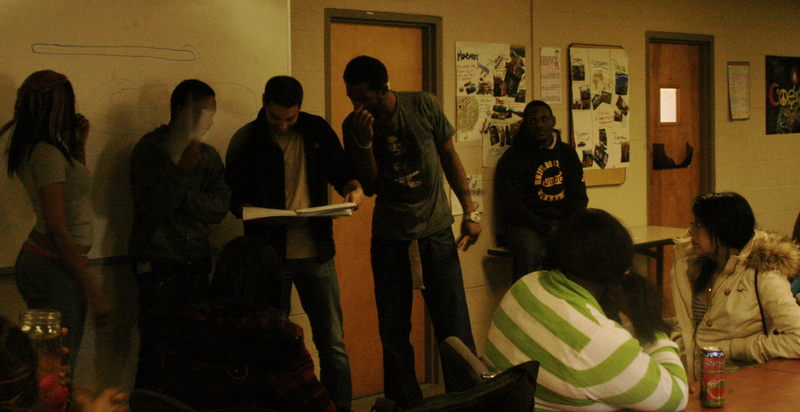 This group dynamic allows students to bring their own talents to the project and work on area they are interested in. Sebastion, Unity student, is putting his artistic talents to work by drawing designs of aquaponics systems for project planning. Thomas, another student, used to work construction and he finished off our project classroom with a coat of deep yellow paint in our last workday. Marlecia is part of the business team, and she brings her energy and focus on organization to help plan business ideas to sell the local and fresh food produced from aquaponics this Spring. At Unity, students undergo challenged and disruptions due to family, economic, and life struggles, and some days it takes more energy to put those struggles aside to focus on school. I see the goal of this project at Unity as presenting these students with activities and opportunities in sustainability and entrepreneurship that they will be engaged in, energized by, and grow from. For students to be managing aquaponics systems during their school day into the Spring and next year, caring for the Tilapia fish, planting, and harvesting vegetables and then distributing them to the local area. We’ll see where the year takes us. This entry was posted in Alumni Spotlights and tagged aquaponics, carey, sustainable community organizers, twin cities by s0luti0naries. Bookmark the permalink. 😀 thanks Daria, hope school’s going well! This is so cool, Carey! I loved hearing about what you’re up to at YEACorps…sounds like a very exciting project to be working on. This is so awesome, Carey! It was fun to read about what you’re doing.